This premium industrial complex completed in July 2016, by Arrow International, was built for freight & logistics, wholesale trade, import/export, manufacturing & assembly and food manufacturing businesses looking for an area to lease close to the airport district. Hampden Fence installed 507m of 2.4m high Pipe & Mesh Chainlink Fencing with top and bottom rails, powder coated with fusion bonded mesh security fencing around the entire perimeter of the site. As well as the security fencing, Hampden also installed a custom fabricated steel sliding gate with hot-dipped galvanised, black powder coated finish to seamlessly integrate into the overall style of the rest of the security fencing. The gate was automated with a heavy duty 100% duty Cycle high-speed gear motor to ensure a secure, yet convenient access to the site for tenants. Hampden Fence is a specialist in high-security fencing, gates, and automation solutions is expert in helping deliver tailored high-security packages that meet the specific needs of property owners. 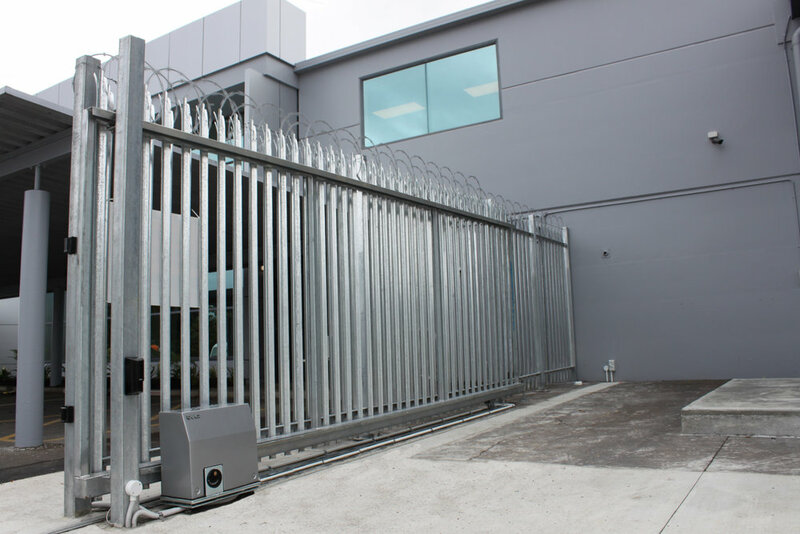 Hampden recently helped to deliver a tailored high-security installation at Brightstar Logistics in Mt Wellington, Auckland. This tailored package included 358 Anti-Climb Rigid Mesh panels with sharks-tooth spikes for additional deterrence, ArmourFence Palisade fencing with ArmourBarb Razorwire ribbons, Palisade Gates with Gate Automation, and concrete-filled static bollards to restrict the access of vehicles into selected areas on site. Sistema is a genuine modern-day New Zealand success story. From humble beginnings in a garage like many other New Zealand start-ups, to some 30 years later where it is now exported to 82 countries around the world and counts its customers in the millions. The Sistema team is very proud of its success, almost as much as it is of it's new state-of-the-art 200,000 square foot manufacturing plant and distribution centre, recently built right here in Auckland. 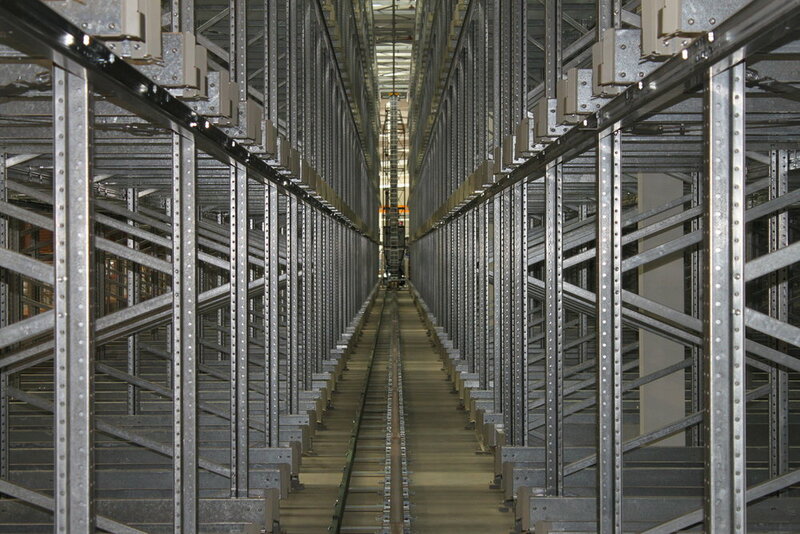 In one sector of the warehouse, world-leaders in shelving and storage systems Dexion have built a $16m bespoke floor to ceiling racking solution for Sistema across 5 large bays. Between bays are floor to ceiling picking cranes that move at 4m per second to keep up with global demand for the product. With automated heavy machinery moving at such pace, ensuring the Sistema team is not in the wrong place at the wrong time, and collected by a crane with tragic consequences, is paramount. Dexion called on long-standing security and safety fencing partner Hampden Fence to help secure its installation. Hampden used 436m of 2.3m high Welded Mesh fitted to the back of the racking to create a barrier between crane aisles to make it impossible for staff to move between rows from within any of the bays. Large apertures, however, allow for excellent visibility throughout the installation. Furthermore, around the entire outside perimeter of the storage installation, Hampden installed 218m of 2.1m high Pipe & Mesh Chainlink Fencing with Top Rail which ensures staff cannot accidentally enter from the sides. This means only authorised staff can enter through secure entry at each end which disables the crane in that bay. Bob Keenan, Project Manager for Dexion, was once again impressed by the professionalism and efficiency of the Hampden team across the project. “The Hampden team were required to attend site on 6 occasions over a two-month installation window, and were able to complete each phase of work on time ensuring our commissioning continued on schedule”, he explains. “Dexion always get a great outcome when we use Hampden because they have good guys with excellent skills. It’s great we can count on that reliability on a large project of this scale”, he adds. Hampden has some of the most experienced teams in the fencing industry, and its resources and capabilities are second to none, which makes it the ideal partner for large scale, complex security fencing projects like that of Sistema. “We offer a true end-to-end service with excellent planning and design support, high-quality fabrication services and exceptional installation management”, says Kristian Baldwin, General Manager at Hampden Fence. “This all wraps up into our Hampden 10 Year Post-to-Post Promise, which extends well beyond the sale and installation period with market-leading after sales support as required”, he adds. Project Century was the relocation of Lion Nathan's iconic Newmarket manufacturing and warehousing facility to a new green fields location in East Tamaki, Auckland. The new facility, spread over 16.7 hectares was built by Mainzeal - Northern Region, over a period of 28 months, and was unique in that the construction team was required to integrate into a progressively functioning brewery operation. Site security, and preventing the entry of all unauthorised people at every stage of construction, was therefore a key project deliverable for Mainzeal. Mainzeal Property and Construction Ltd has been at the forefront of the New Zealand construction industry since 1968. The company has established a reputation for the delivery of high-quality construction, infrastructure and refurbishment projects and it has extensive experience particularly within the health, education, government, local municipal, industrial, commercial, recreational and sport, retail & hospitality building sectors. With the high-profile nature and vast scale of the new Lion Nathan Brewery location, Mainzeal had to find a security fencing partner that could guarantee the resources to ensure it remained responsive to the changing needs of the site at all times. entire site had adequate perimeter fencing, even at the start of the project, for obvious Health & Safety reasons and to address security issues such as theft”, says Bruce Hayes, Site Civil Engineer for Mainzeal. Hampden's close proximity to the Lion Nathan site meant that it was able to quickly and effectively provide the product and resources Mainzeal required to meet tight deadlines at various stages of the project. “We would have at least 1km of Temp Fencing in place at any one time and as work moved around the site Hampden's response times for updates and emergency call outs was exceptional”, says Mr. Hayes. Hampden brought in a Bobcat to help Mainzeal clear some unruly terrain that was riddled with Gorse and other growth. “We were very impressed with the resources that Hampden had at its disposal, and its access to other quality sub-contractors was strong”, adds Mr. Hayes. The perimeter was ultimately electrified and Hampden's Electrification team swung into motion. “We were impressed with the competency of Hampdenís electrics team”, says Mr. Hayes. “I would ring with timing details for the 4 zones and if it wasn't sorted that day it was addressed the day after”, he adds. Hampden Fence is New Zealand's largest and most competent fencing company, and that made it an easy choice for Mainzeal.